¡Es el momento de nuestro esperado… MARTES DE PAELLA Y FIESTA EN FONTANA! 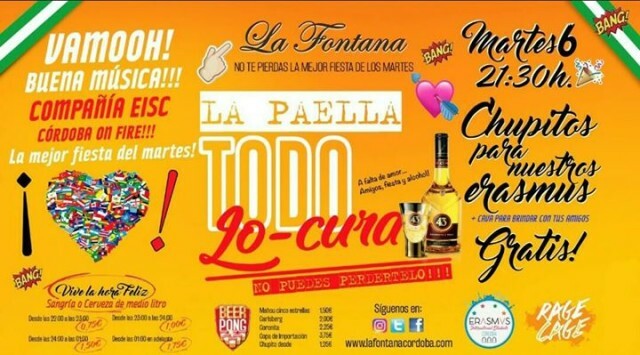 It’s time for our weekly paella parties to begin in Fontana pub!!! Every Tuesday we offer you a delicious free paella, free shots, free cava, beer pong, music, as well as cheap beer and sangria!! Click the link below to get an idea of what your Tuesday’s will look like with EIS. Become a member of EIS at our office (also located in Fontana pub) between 18.30 and 20.30, Monday to Friday. In order to avoid long queues in the office, please fill out this membership form beforehand.